I found this fascinating. A modern heroic tale: “Biowolf” – It is a tale of dogged determination especially for Mike Smith. A fascinating combination of innovative thinking, technical investigation and good fortune. I know the city a bit but was surprised how unaware I was of it and what a positive feeling it gave me about the place. You can read a more detailed summary of readers comments here. The Southampton Learning History can be downloaded from the Lowcarbonworks project website here"). At the workshop active readers recorded thoughts, feelings, and ideas in workbooks just after they had read the Southampton Learning History (which can be downloaded from our project website here"). The headline responses can be read here. In general the story of the scheme fascinated readers and its scale at once impressed and depressed them: “Argh – they had geothermal and started years ago with political consensus”. Readers grappled with the role of the geothermal aspect. Southampton were lucky to have it: Those lucky Geothermal bastards! exclaimed one reader. But another noted that it had just enabled the first stage in a series of innovations – “innovation is breeding innovation”. Several points were of interest: for example the coming together of agendas and partnerships; the role of energy security as an enabling factor and the way people’s perception of how best to do heating was hugely influenced by past history. But readers were particularly interested in understanding the success factors of the scheme. The main factor identified was the personalities involved who made it happen over a long time: The key factor was the willingness to be innovative and the determination to see it through wrote one reader; another echoed this writing: there were key individuals holding it together and others coming in to infect new ideas and drive. There was admiration for the characters’ persistence and determination. As with other histories, readers explored too themes of vision and chance. The way the scheme developed organically rather than in a controlled, linear fashion was noted by readers. Working to a vision over time was seen as significant. This was about “sustained change” commented one reader – “the technical stuff is less important than the vision”. Readers noted the role of chance – questioning it too. How does chance relate to luck? This question has been explored in more detail here. And, ‘at what point does a vision become self-fulfilling?’. With this history there was curiosity rather than suspicion about missing perspectives (see questions). There was a desire to hear more from protagonists, to learn how local communities perceived the scheme and how this had changed. There was also a desire know more about the mirror story of how things unfolded in the private sector as different clients connected. 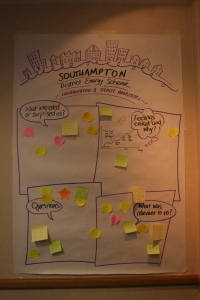 Find out more about the questions Southampton readers posed. Find out too what readers of the Southampton history found relevant to their experiences and challenges. For one active reader of the Southampton Learning History (which can be downloaded from our project website here) the Southampton scheme drew parallels with attempts to develop a similar scheme in Nottingham. The scheme there was at a low point for many years – but could have developed in the same way if the same ‘characters’ had been around. Another reader pointed out the links with waste heat and power. And another saw how the Mayor in his authority currently enjoys the freedom to innovate in a way that is similar to that enjoyed by political champions in Southampton. Reader’s took away questions: How might we get something like this going? What motivates the experts and advisers we employ? And actions: Brainstorm ideas with senior officers; do some background reading. They also took away ideas about using the Learning History approach in other settings to motivate change.